The 2014 Tundra's bumpers have been changed from a one-piece exterior assembly to three pieces for cheaper and easier replacement in the event of an accident. for the range of trim levels. PITTSBURGH -- Toyota is taking the conservative path with the re-engineered 2014 Tundra full-sized pickup. In 2007, the Japanese automaker threw down a challenge to the Detroit 3 by introducing a redesigned Tundra with a new family of V-8 engines that pushed technology and fuel economy for the segment. It also opened a hulking $2.2 billion plant in San Antonio capable of producing 200,000 units a year -- with lots of room to grow. Then the economy collapsed and full-sized pickup sales in the United States plunged nearly 50 percent. Toyota's gamble had failed. Expectations for the Tundra have been pared way back, and it shows with the 2014 re-engineering. While redesigned pickups from Ram and General Motors have new underpinnings and running gear -- as will next summer's Ford F-150 replacement -- Toyota kept the Tundra's powertrain and platform largely intact. 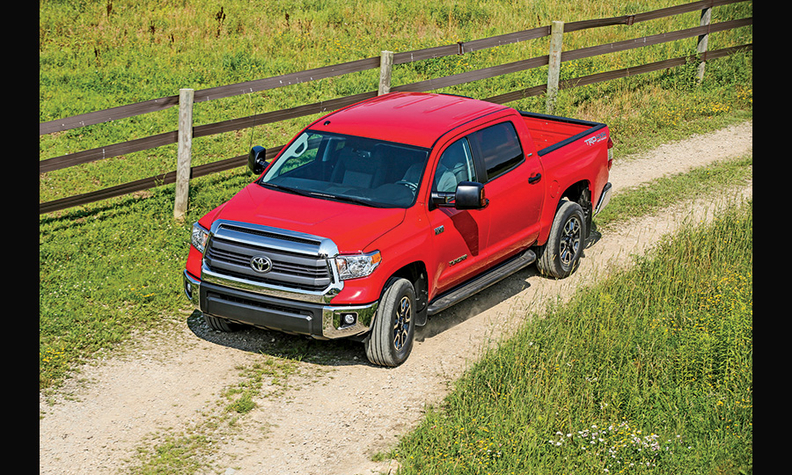 The basics: The Tundra retains its three-engine lineup: a 4.0-liter V-6 and 4.6-liter and 5.7-liter V-8s. The V-6 is still mated to a five-speed automatic transmission, while the V-8s remained hooked up to six-speed automatic transmissions. The Tundra has a shorter overall length than comparable trim levels of the new Ram and Chevrolet Silverado, but it has the best approach angle of any full-sized pickup -- a big plus for ranchers and off-roaders. Although the suspension design is carryover, Toyota changed the valving in all four shock absorbers and adjusted the spring rate on the rear leaf springs. Notable features: Inside, the old model's instrument panel design had separate binnacles for each gauge; now they are all clustered under the same hooded display. The center console and touch-screen display are 2.6 inches closer to driver. The front and rear bumpers have been changed from a one-piece exterior assembly to three pieces for cheaper and easier replacement in the event of an accident. Standard features include air conditioning, cruise control, power windows and mirrors, rear backup camera, 18-inch wheels, halogen headlights, front tow hooks, tire pressure monitor, trailer-sway control, variable windshield wipers with de-icers, dampened-release tailgate, front and rear mudguards, fold-up rear seats, two 12-volt auxiliary power outlets, 6-inch touch-screen display and alarm system with engine immobilizer. What Toyota says: "When we launched in 2007, we had the most advanced powertrain on the market. Now [Detroit's engines] are just competitive," said Mike Sweers, Tundra chief engineer, at the press introduction here. "We updated the hardware and still have one of the most advanced powertrains on the market. In real-world testing, our 5.7 gets the same fuel economy as their turbo-sixes, especially in a heavy-load towing situation." Shortcomings and compromises: Toyota says it has corrected some of the Tundra's flaws -- such as driveline clunk and bed hop, which happens when trucks with empty beds lose contact with the road surface in hilly terrain -- but there are no major technical advances. And Toyota deleted the driver's side A-pillar grab handle, making it harder for the driver to get in and out when there is mud underfoot. Toyota also deleted the standard bed from the regular trim level. The market: The full-sized pickup market is recovering, but Toyota has conservative targets -- about 137,000 units in 2014, compared with its peak of nearly 200,000 units in 2007. With the Tundra and Tacoma built in San Antonio, Toyota can adjust production as needed, said Bill Fay, Toyota Division general manager. Fay said he sees "some upside" beyond the Tundra's volume target. For its marketing push, Toyota will reinforce the quality, durability and reliability capabilities of the truck, and "tell the American story" of its local manufacturing, Fay said. He said Toyota will probably not do any compare and contrast advertising against the competition. The skinny: Toyota seems to have shifted from its goal of winning over domestic truck owners. Instead, it now seems to be trying harder to retain Toyota loyalists. The Tundra's equipment levels have been cranked up, adding more luxurious trim packages in an effort to increase the transaction price. While Toyota may be selling fewer units, it hopes to make a larger profit on each one.